I gave a lightning talk last May for the Node.js DC meetup on Derby and Meteor. It led to a good discussion, which isn’t surprising since both frameworks are great demonstrations that Node is functionally capable of much more than just cloning Ruby libraries. The guys running the Northern Virginia Node meetup felt there was more to cover and asked me to do a longer overview at the July Nova Node meetup. Apparently the subject is popular since we had a “sold out” room last night. I was a little worried about taking the whole hour, but got a lot positive feedback afterwards. Free pizza, beer and sodas from the meetup host SpanishDict.com probably didn’t hurt either :). SpanishDict.com is running on Node now, and handling tons of customers successfully at much lower loads than they were seeing with their previous environment. Several folks (including me) asked for an overview of the production lessons they’ve learned for the next NoVa Node event. Here is the deck I presented on Derby and Meteor. My goal was to get the core concepts across for discussion, not to teach them. That said, if you do have questions feel free to tweet me or leave a comment. If its guts stuff though, I suggest you go to experts in the relevant Google groups or hit StackOverflow. Well, I’m coming off another StartupWeekend high. This one was StartupWeekend Virginia for Education – sponsored/organized by the excellent Virginia Center for Innovative Technology (including DC Tech pillar Jen O’Daniel). I really love being a part of StartupWeekends. Watching people turn raw ideas into prototypes and a strong pitch in just 54 hours is awesome. Even better is watching folks learn what it means to be an entrepreneur – not to mention how much fun it is. Of course, being a coach/mentor is great because I get to talk to so many folks about their ideas, and then see those ideas get fleshed out and come to fruition. Giving up a weekend seems like a small price compared to the feeling that you’ve helped these amazing, hardworking teams get closer to achieving their goals. Our path to Startup Weekend began with a comment that became an action and resulted in a meaningful outcome all in the space of 4 weeks. And while many of you who were interested in supporting our effort couldn’t attend, I wanted to include you in this email because you are a part of our community, because you are passionate about education, and because your interest and genuine desire to make a difference matters and was a source of inspiration and insight to our effort throughout the weekend and I wanted to acknowledge that. Our team pitched two ideas and both were selected to be worked on and refined over the course of the Startup Weekend. We went with one idea, had the biggest team, and went to work on the biggest problem at the event. Our group was the first team in and the last team to leave each day and this did not go unnoticed by the dedicated coaches and mentors who were there. Of the 40 or so coaches and mentors there, over half of them spent significant time with our team and made pivotal impacts that helped us put the legs to what had been a personal story and a few words scribbled on a half torn piece of paper on Friday night. It was clear that what we were tackling resonated and that we needed to really craft the message so that we could get it out. I am in awe and humbled by the difference their feedback made on our team and our effort. They are truly amazing people with a generosity of spirit that is mind blowing. The outcome of all of that committed and focused effort was an Honorable Mention at an event sponsored by a globally active organization. Not too shabby a showing for a first time team with lots of mixed skills, no real prep ahead of time, and whose pitch deck got finished with only 9 minutes to spare before the final pitch round started!! We should all be proud! I could not have spent 54 hours with a better group of people. I want to send a sincere thank you to Paul McGowan (CIT), Hap Connors(CIT), Brooke Bell (CIT), Carole Ottenheimer (CIT), Mary Garber (FredTech Council/Fred Chamber of Commerce), and George Hughes (SIMVentions) for their outreach, support, and continued engagement. This milestone would not have happened without your passion for entrepreneurship and Fredericksburg. I want to send a special shout out to Ann Emerson whose show of support made all the difference and Mary Garber again for”getting outside the building” and getting us important data for customer validation. Heartfelt thanks to the Mikes (McVicker and Wellman) for putting a view to this big idea we had in the nick of time and David Tuell for finding the tag line that pulled it into view and said it all and Brian for doing research at a moment’s notice and getting good results quickly each time. Thank you to Simona and Vlad for throwing in with us and making critical contributions to the prototyping, customer validation, and development of the pitch deck. We couldn’t have done it without you. And finally, I want to acknowledge David Rees – a mentor who spent 40 of the last 41 minutes we had making magic happen for us. It was his coaching and mentorship that brought the vision that we had scattered across the whiteboard and screenshots and collective heads in the room into view. Dave, you are a genius and your passion for our story was the breath of life that helped us bring it into view for others to see. We are eternally grateful for the difference you made and when you made it. It felt like nothing short of serendipity just in the nick of time. Can’t wait to return the favor. NOVA EDU Startup Weekend was an amazing and impactful experience for all the right reasons. Can’t wait to bring one to Fredericksburg! I love unit testing, and the confident feeling I get from my code being “all green”. But sometimes there are tests that need to be skipped for a bit, perhaps due to a failing backend service or an in-progress refactoring. The easiest solution is to comment them out, but then it’s easy to forget they are being skipped. Instead, I simply added a new test type – testSkip – to QUnit using the following code. Now when the test is skipped we see it marked as SKIPPED in the QUnit results. I use a similar approach for QUnit tests that involve user interaction. I run lots of tests when coding, but the interactive ones get in the way of my flow. So I have added the test type testManual which allows me to run them explicitly by simply adding testmanual to the URL parameters. A similar approach can be used for other test categories or to target tests to a particular browser. Cool beans. I’ve been selected to talk at the upcoming StartupAmerica DC Ideas Summit along with Aneesh Paul Chopra (US CTO) and a bunch of great DCTech folks. 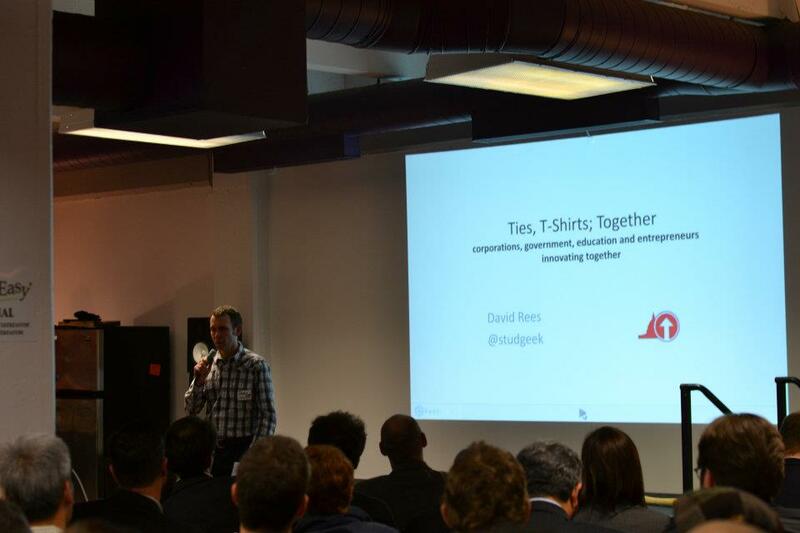 I’ll be talking about “Ties and T-Shirts; Together” – how the DC startup and government/business communities should be working together and leveraging our collectives advantages as a region. There’s been a lot of excitement around the Startup America intiative in general, but we’re really going to hone in on the specifics of the DC startup community. If you’re in the area I hope you’ll come to the talk. Don’t be afraid to say hello afterwards (and mention that you read the blog!). I don’t know what happened to the video, but my slides/prezi is available here. And I added a blurry shot of me evangelizing t-shirt/tie togetherness above. I’m still recovering from mentoring for the first Startup Weekend DC. It was an amazing weekend, so many ideas and so much energy. It felt like I was mainlining startups :). I guess my enjoyment showed because I was awarded “most helpful mentor” and given a very snazzy USB Power Pack for keeping my phone and tablet juiced. Now I’m lead mentor helping the winners of Startup Weekend DC, Weekly Eats, compete in the Global Startup Battle. It’s a worldwide competition pitting the winning StartupWeekend teams from sixty cities against each other for a cool set of prizes including the chance to present at Demo Asia and the Launch Conference. Thanks to great work by the WeeklyEats team and the DCTech community we came in 3rd! The team started with an awesome video submission and then we drove a non-stop SMO campaign to get the word out. It was an amazing amount of work to keep the energy up and votes coming, but we did it! Congrats WeeklyEats and DCTech :). I’m going to guess you are familiar with Backbone, the MVC framework of choice for many web developers. I use Backbone a fair amount for its Model and Event aspects both because it works and it’s often what others expect. But there is one feature I miss with Backbone event handling – the ability to listen for an event once (like jQuery’s once). You can write your own code to simply ignore later events, but the event handling code is still there. It would be better to unbind, but with Backbone that means holding on to the callback function so you can unbind it on the first callback, and to do that you have to assign your callback to a variable which can clutter up simple event handling code.